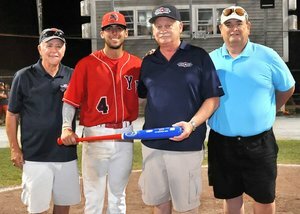 The Yarmouth Dennis Red Sox defeated the Falmouth Commodores, 3-0, in tonight’s Game 3 of the Championship Playoff Series at Guv Fuller Field in Falmouth. 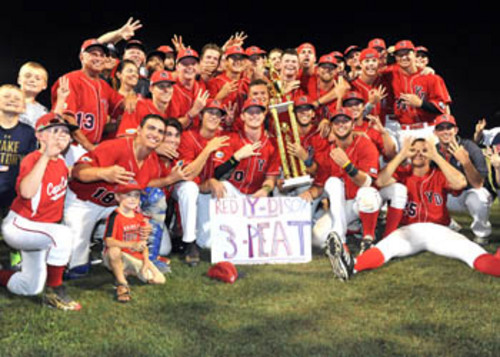 With a call strike three to end the game, YD was named the 2016 Cape Cod Baseball League Champions for the third consecutive year. Within minutes of the first pitch, the Red Sox got on the board. Off a sac-fly to center, hit by the 2016 CCBL Championship Series MVP Kevin Smith (Maryland), Dillon Persinger (California) was able to score. Persinger got on base by doubling down the third base line off the first pitch of the game. Success came early for YD as they secured two more in the top of the second. Matt Winaker (Stanford) put runners on second and third with his ground rule double down the left field line to set the stage. Falmouth’s Jake Bird (UCLA) committed a balk, forcing the runner on third home and giving the Sox the 2-0 lead. Nolan Brown (Texas Christian) proceeded to single up the middle, pushing YD’s lead to 3-0. Bird was relieved after 1.2 innings of three run baseball, for Falmouth. Success at the plate came with YD’s success on the mound; Bryan Sammons (Western Carolina) threw four scoreless with five strikeouts, before earning a final line of 6 IP, 2 H, 0 ER, 6 SO, when relieved mid-seventh. Although Falmouth managed to get on base, they were unable to come back from the lead YD set early. “There’s no doubt you want to score first in a game like this. That way they’re chasing us the whole game instead of us chasing them,” YD manager Scott Pickler said, of the early lead YD got. 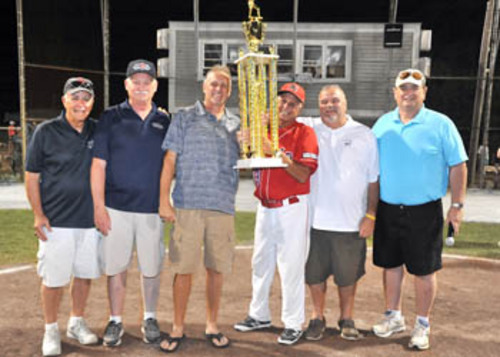 With room to breath, the Yarmouth Dennis Red Sox were able to calm their nerves and play baseball as they always would. They were able to keep the game at a 3-0 lead and to cruise to victory over the Falmouth Commodores, making this years win, a 3peat.